Upper Deck Entertainment brings joy to this year’s holiday season with highly collectible Yu-Gi-Oh! TRADING CARD GAME collectible sets – the Yu-Gi-Oh! TCG Collectible Tin and the Yu-Gi-Oh! TCG Master Collection. Anticipated to be the hottest-selling toys of the season, the new Yu-Gi-Oh! TCG tins and Master Collection gives the Yu-Gi-Oh! TCG collectors a chance to collect previously released boosters, brand new cards, and powerful variant cards, including the much-sought after “Exodia the Forbidden One” card. Available in September, the Collectible Tins allow Duelists to make their Decks much more powerful, with a collection of booster packs designed to increase the complexity and power during matches. These tins offer an assortment of the game’s top-selling booster packs, which include Pharoanic Guardian, Magician’s Force, Dark Crisis, Invasion of Chaos, and Ancient Sanctuary. In addition, each of the six unique tins will include one of six brand new cards. Last year, the Yu-Gi-Oh! TCG Collectible Tins were featured as an “All Star” in Toy Wishes Magazine, and in recent years, earned top spots on the hottest Christmas wish lists at KB Toys, and was listed as one of the most highly sought-after toys in Toy Wishes Magazine, Business Week, Wall Street Journal, and USA Today. In December, UDE is also pleased to release the new, and first-ever Yu-Gi-Oh! TCG Master Collection. 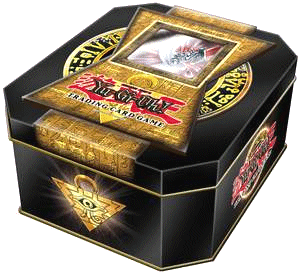 This highly collectible set will include the first six Yu-Gi-Oh! TCG boosters ever released in a stylish, gold, Egyptian-themed storage portfolio. Each folder will include a Legend of Blue Eyes, Metal Raiders, Spell Ruler, Pharaoh’s Servant, Labyrinth of Nightmare, and Legacy of Darkness booster packs, and six variant cards, including the highly sought after “Exodia the Forbidden One” card. For more information on tournaments, the latest in Yu-Gi-Oh! TRADING CARD GAME news and product introductions, visit www.yugioh-card.com, or www.upperdeck.com. About Yu-Gi-Oh! The object of the Yu-Gi-Oh! TRADING CARD GAME is to win a Match (which consists of three duels) by reducing an opponent’s “life points” from 8,000 to zero. This is accomplished through a series of turns using a deck with a minimum of 40 cards and a combination of strategy, skill and luck. Three main types of cards are used in Yu-Gi-Oh! TCG: Monster Cards, Spell Cards and Trap Cards, with each category being further divided into sub-categories. For more information on the Yu-Gi-Oh! TRADING CARD GAME or Upper Deck Entertainment, please visit www.yugioh-card.com or www.ude.com. Konami has shipped over 4 million units of Yu-Gi-Oh! video games in North America since the series’ debut in March 2002 including: Yu-Gi-Oh! Forbidden Memories for Sony PlayStation, Yu-Gi-Oh! Forbidden Memories Premium Edition for Sony PlayStation, Yu-Gi-Oh! Dark Duel Stories for Nintendo Game Boy Color, Yu-Gi-Oh! The Eternal Duelist Soul for Nintendo Game Boy Advance, Yu-Gi-Oh! Dungeon Dice Monsters for Nintendo Game Boy Advance, Yu-Gi-Oh! The Duelists of the Roses for Sony PlayStation 2, and the recently released Yu-Gi-Oh! Worldwide Edition Stairway to the Destined Duel for Nintendo Game Boy Advance. The games are recognized for the deeply strategic and challenging gameplay based on the mega-popular Yu-Gi-Oh! universe. The Yu-Gi-Oh! franchise is based on the Yu-Gi-Oh! comic series from artist Kazuki Takahashi that first appeared in Japan in 1996. It is currently being serialized in SHONEN JUMP, the monthly manga magazine published by VIZ, LLC. The comic spawned a hit cartoon TV show, a top-selling collectible card game, several video games and other licensed merchandise. Yu-Gi-Oh! follows the adventures of Yugi, a young boy who possesses the “Millennium Puzzle” that allows him to transform into the “Game King” whenever he is challenged. 4Kids Entertainment Inc. manages the merchandising and television rights to Yu-Gi-Oh! in the United States. The animated series, Yu-Gi-Oh! King of Games is broadcast 11-times per week on Kids WB. Read Full Press Release.